Out of time? Too tired to get to the gym? You can do some of the hottest club workouts right at home! Total Gym is, hands down, the best home workout routine you can do in the least time and get great results. 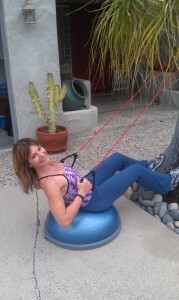 One of my client’s favorite exercises to do on my Total Gym, was to lie on the steepest incline and just invert safely. Total Gym exercises are extremely beneficial for the body and the brain. Dance has always been one of the most popular fitness trends because it’s so much fun. From Hip-Hop to Zumba – or any high-energy dance moves – all you have to do is put on your favorite music, set a timer and allow your body to move to the music! Turn your home workout routine upside down with suspension training. The original TRX can easily be set up anywhere in the home or garden. Crosscore 360 is another great version of this type of workout; and my personal ‘want’: the Anti-Gravity Yoga setup. Spin classes are in gyms everywhere – but you don’t have to go to a spin or cycle class to get the benefits. If you have a bicycle, hit the road or beach, and feel the sunshine and breathe the air while getting a good workout. But if you do have a stationary bike, you can enjoy a spin class at home by following one online, or with a spin class video. Bodyweight training is one of the best ways to give the body more functional and intelligent strength, flexibility and endurance. I personally love the Lebert Bars and the wonderful variety of exercises that can be done on them. Treat yourself to some Self Care. Body rolling with a foam roller will increase water absorption in order to hydrate the body and decrease muscle soreness after working out. Meditation, prayer or spending time in silence makes a significant difference in stress levels and the digestive system. Along with rest and stretching, your body will thank you for giving it what it needs! You don’t have to be a yogi to practice yoga. There are so many wonderful variations of this ancient practice to be found online, on demand and on DVD. Try the tree pose for balance. The barre workout is a ballet-inspired workout that helps you develop lean muscles and burn calories while improving your balance and flexibility. You can do barre exercises at home with a chair and a pair of weights, or you can get your own barre. Excellent form and technique is essential for high-intensity interval training and Tabata. These workouts are super time savers – trainings are anywhere from five to 15 minutes long – and great calorie burners. Cardio Drumming; combines drumming with music and movement, and helps the brain to function, increases hand-eye coordination and creates new neural pathways! All you need are drumsticks, a finessball, a drum and your hands. Yes, you could get home from a tough day and decide to “veg” in front of the TV – or you could commit 30 minutes to whichever workout style appeals to you on that day, and go for it! Listen to your body; it knows what you need – and rest may be it, so allow yourself a break. And remember to breathe, drink lots of water and take time for yourself. We’d love to hear from you! Let us know which workouts you prefer to do at home in the comments.